Experienced vote counters do not believe that either the House or the Senate will muster the two-thirds majority necessary to override President Obama’s veto of the Keystone XL pipeline bill. If so, Mr. Obama’s years of delay and disingenuousness on this issue, culminating in his veto, will guarantee negative consequences for America long into the future. Keystone is a textbook example of the integral relationship between foreign and domestic affairs. The pipeline’s economic benefits are evident, including facilitating increased supplies of North American oil; helping integrate U.S. and Canadian hydrocarbon infrastructures; and providing energy without international political risk. But blocking Keystone is not merely bad domestic policy. Equally unfortunate, and perhaps worse, are the negative implications for America internationally. Mr. Obama’s veto thus provides a leadership test for prospective presidential candidates. In particular, the Keystone XL controversy highlights Hillary Rodham Clinton’s acute political dilemma over whether and how to separate herself from her own record as Mr. Obama’s first secretary of state. She has a lot to answer for, and she will have to state her position on his veto, if not now, then certainly when she becomes a declared presidential candidate. Will she support the veto, or will she finally find a major issue on which to distance herself from her former boss? She went on to bemoan congressional failure to pass Obama administration environmental and “clean energy” proposals, but her self-professed “inclination” favoring the pipeline was clear. Subsequently, however, in 2012, Mrs. Clinton supported Mr. Obama’s objection to proposed legislation requiring the president to make a decision on Keystone XL within 60 days. In a carefully worded statement, the State Department did not object on the merits, but merely argued it hadn’t had enough time to complete its “national interest” review. Mr. Obama continued dodging a decision for three more years, until last week’s veto of a new legislative effort to force his hand. Mr. Obama’s ideological intransigence on Keystone XL has already harmed our relationship with Canada. That takes work, but Mr. Obama succeeded both because of his policy objections to Keystone and because of his flip and gratuitous mishandling of Canada. For starters, Mr. Obama chastised Prime Minister Stephen Harper’s government for weakening Canada’s environmental laws involving tar sands (which would produce a substantial part of the pipeline’s flow-through). Mr. Obama doubtless also opposes Mr. Harper withdrawing Canada from the Kyoto Protocol. Mr. Obama then complained about the number of Canadian jobs Keystone would create, as if new jobs there reduce new jobs here. Obviously, the Canadian and U.S. economies are inextricably intertwined, to the enormous benefit of both. Mr. Obama complained further that only Canadian oil would be shipped through the pipeline, and it would all be sent overseas rather than used in the United States. Both these points are wrong. Oil from our own Bakken shale formation would be an important element of the pipeline’s business, and significant amounts could be refined and sold here. Across both the Atlantic and the Pacific Oceans, key U.S. allies are eager for U.S. energy production and technology to help free them from dependence on politically chancier sources of oil and natural gas. Europe, finally awakened by the Ukraine crisis, urgently wants to reduce its dependence on Russian hydrocarbons. North American oil and gas would provide an alternative source not only to help keep prices down, but also to provide a strategic alternative. Similarly, Japan, South Korea and Taiwan would welcome alternatives to Middle Eastern oil, itself inherently risky politically, but also increasingly endangered by Beijing’s efforts to turn the South and East China Seas into Chinese territorial waters. Moreover, North American energy could also be sold directly to China, thereby helping mitigate the balance-of-payments deficits that have provided Beijing with enormous dollar assets in recent decades. 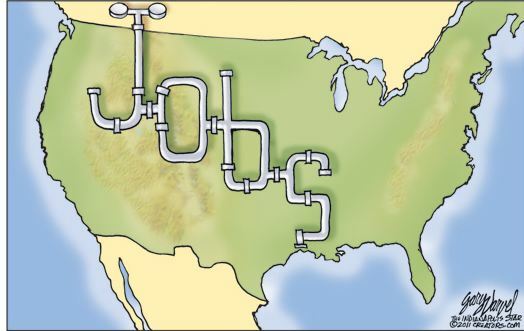 Given the undeniable deniable economic and international strategic benefits of increased North American oil and natural gas production, exemplified by Keystone XL, this issue will unquestionably loom large in 2016’s presidential campaigns. U.S. public opinion polls have repeatedly shown majorities supporting the pipeline, despite opposition from powerful, well-funded environmental groups. And there, of course, lies Mrs. Clinton’s dilemma. This is only one of many, but her ultimate Keystone XL position is also directly tied to her performance as secretary of state, the one resume item that she is relying upon to qualify for the presidency. This is an issue to watch. • John R. Bolton, a former U.S. ambassador to the United Nations, is a senior fellow at the American Enterprise Institute.